Looking for an easy to install gate kit for your angle strainer posts? Whether your posts have wire or not, our adjustable angle post gate kits can easily bolt-on with little trouble. The bolt-on angle post gate kit is easy to install. You no longer need to worry about wire getting in the way. Just wrap the triangle bolts around your post, attach its plate in the position you want, and bolt it together. This design also allows you to adjust the gate kit up and down your angle post. 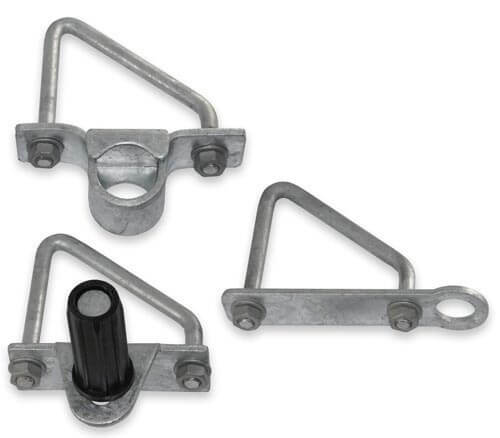 Our unique angle post gate kit design includes a gudgeon that is adjustable. You can slide it back and forth to get the perfect angle for your gate. For added stock proofing, the ring on the latch plate is in the vertical position. This makes it harder for cattle to knock your hook latch out. It will hit the top of the ring and fall back in. 3 triangle bolts for 75mm posts. A bottom adjustable gudgeon with plate and nylon bush. The bottom gudgeon pin on this bolt-on angle post gate kit has the ability to move backwards and forwards. This allows you to slight raise or lower your gate. Now, you can get the swing just right!